Friendlydragon Racing: So that'll be 2014 then! So that'll be 2014 then! Progress on the race car is slow but moving steadily in the right direction. 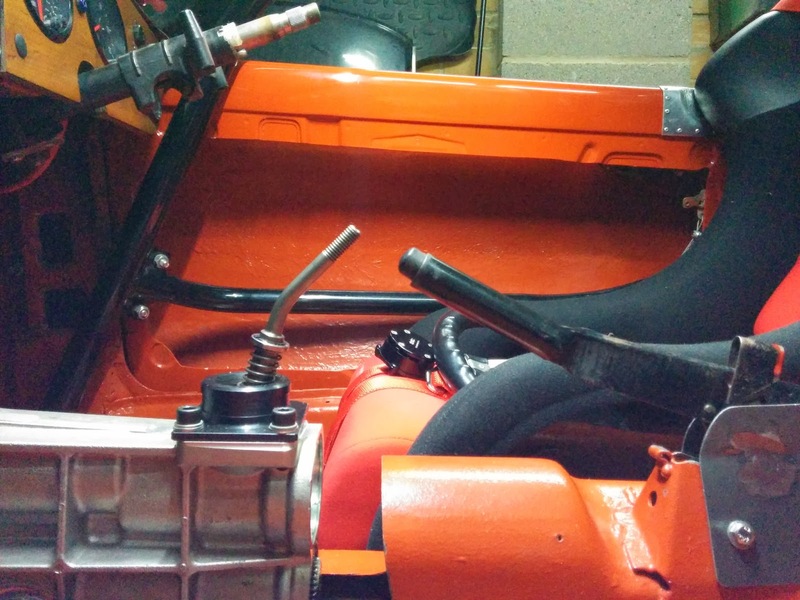 All the interior (such as it is) is now fitted, the engine is back in and I'm slowly fitting up various bits and pieces. Well that sums up about six months work in one sentence. The reality was a little more complicated of course. 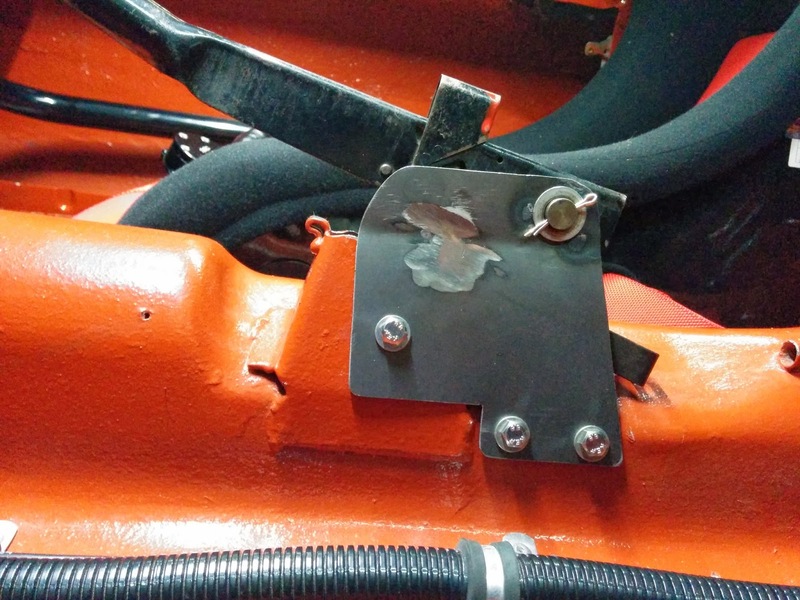 The biggest issue I've encountered was that I found rust in the floorpan of the car. Nothing fatal but it needed sorting before I could be happy completing the fitting up. There were a few other minor issues under the floor too, including some not-too-brilliant welding that was entirely my own work. As a result of these things the whole car was shipped off to Willow Triumph near Darlington to have the body lifted off the chassis for a good check up. In the end the bit shown above and a couple of rather thin rear wheel arches were the worst of it but Tim at Willow made an excellent job of fixing all the various minor issues we found and also carried out a couple of other jobs I'd thought of in the meantime but would have had difficulty doing in my garage. Here's the same section of the car as in the first picture as it looks now. A bit different! Once that delay was sorted out, the seat and harness went in. I don't remember whether I posted a picture of the finished seat here before so here it is in all it's glory. And, after a lot of bruised knuckles and the usual contortions required to work at floor level on a spitfire, it really looks the part. I did have to modify the door slightly though. Anyone who remembers this car in its previous guise may remember a similar modification to get the old seat to fit as well. This looks a bit rough at the moment but I have a plan that'll tidy it up later. Since then the engine and gearbox have been refitted. The propshaft I had was too long to fit with the new box but I took it to Dunning and Fairbank in Leeds who shortened and rebalanced it. I've yet to try refitting it but there's no reason why it shouldn't be perfect now. ...the handbrake is rather too close to the gear lever. In fact they overlap with the car in second gear as in that picture. 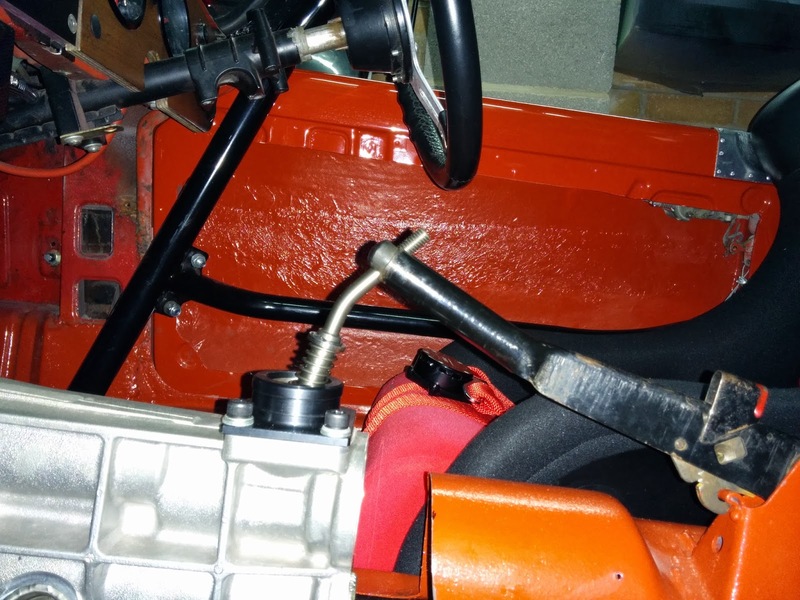 The solution I've come up with is some bracketry that moves the handbrake lever pivot back a couple of inches. I'll need to source a shorter cable at some point but hopefully this solves the problem. I think that just about brings things up to date, albeit rather quickly. The latest work has been to fabricate mountings and other related hardware for the radiator, oil cooler and water pump. That's turned out to be a bigger than expected job too! More on that later when I've got a definite idea what it's going to look like.